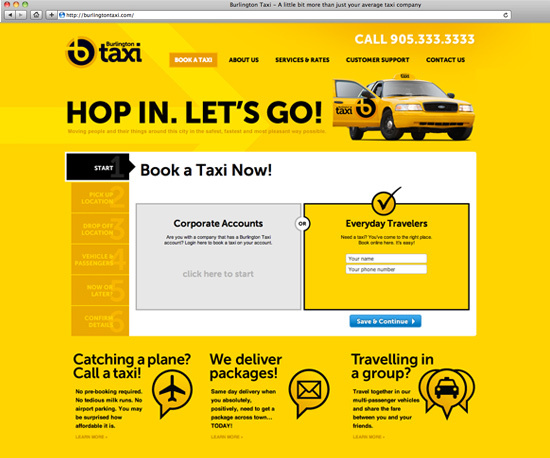 Burlington Taxi is an established resource in Burlington for students, shoppers, seniors, bar patrons and commuters in a market that looks for convenience, punctuality, cleanliness and safety in their taxi service. Earlier this year the forward-thinking company asked us to help them develop their web presence to give their customers another more convenient way to book a cab. In the process it was discovered that they had also drastically outpaced their dated look. So we were honoured when they engaged us for a multi-phase rebranding project, to improve their look, tell their story and develop a website to introduce online booking. The new logo is a dynamic, clean, bold graphic that is easily recognized from a distance and easily remembered. It reflects the level of professionalism with which the brand delivers on its promise “to be an intricate and trusted partner in Burlington’s transit system.” The new tagline, “Hop in. Let’s go!” invites people who need to get themselves or their things across this town to use a friendly, trustworthy, smart, and satisfying service. The primary platform for the logo and tagline is their fleet, so much care was given to the design of the fleet livery. Distinctive and eye-catching, but stylish and modern. Our objectives for their website redesign were to provide an intuitive and integrated online booking system, provide meaningful content and improve site content layout and functionality. The shift in customer expectations for online capabilities was seen as an opportunity to better serve their market. We developed an innovative booking tool for their website, front and centre, that ties into their existing system. Clients can now easily book a taxi with their mobile devices – especially valuable to people out on the town, coming into town on the train or anytime online access is preferred. Keep an eye out for their upcoming marketing campaign to launch their new look and capabilities.